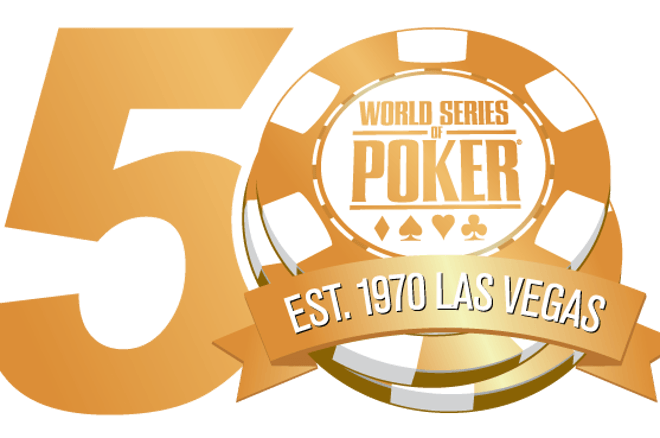 WSOP will celebrate their 50th anniversary with a can't-miss rake-free $500 buy-in $5M GTD event. Every year, players around the world await the schedule for the most prestigious tournament series of the year so they get planning — and dreaming. This year, Caesars Interactive Entertainment is bringing Christmas early with a sneak peek of the 2019 World Series of Poker schedule that is expected to produce prize pools totaling more than $200 million. The 50th running of the WSOP will commence on Tuesday, May 28 and wrap up on July 16, 2019. The seven-week series will take place at Rio All-Suite Hotel & Casino in Las Vegas for the 15th consecutive year, with dozens of poker events on the slate. As the schedule is still being finalized, the WSOP has released details on seven noteworthy events that players can get on their radar. 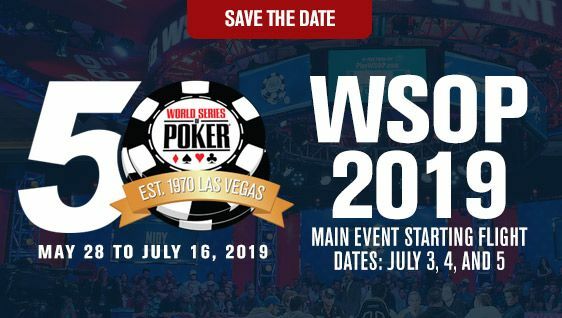 One of the most notable events on the 2019 schedule comes in the spirit of the WSOP’s 50th anniversary. Get ready for the Big 50 No-Limit Hold’em with four starting flights running May 30 – June 2. The $500 buy-in “golden event” will be rake-free for all initial entries and features a starting stack of 50,000, levels of 50 minutes and a prize pool guarantee of $5 million. “We expect our opening weekend Big 50 event to be one of the largest in our history, and certainly one of the best value tournaments ever offered. While it’s not the Millionaire Maker, the winner is guaranteed a $1 million payday, and players can re-enter once per flight, with normal rake charged on reentries. You can also expect additional 50th anniversary themed celebrations, including a celebratory gala and awards evening to take place on Saturday, June 29. Among the finalized events are some fan favorites, including the $1,500 Millionaire Maker that guarantees $1 million prize to the winner, which will kick off June 7 with a second starting flight June 8. One reentry per flight will be allowed and players start with 25,000 chips and play to blind levels of 60 minutes. The 50-plus Seniors No-Limit Hold’em will kick off on June 13 with one reentry allowed. For the $1,000 buy-in, the seniors will get 20,000 in chips to work with and play 60-minute levels. Other event favorites are also set, like the Double Stack No-Limit Hold’em that has starting flights June 14 and 15 with single reentry, the Monster Stack with opening flights on June 21 and 22, and the $888 buy-in Crazy Eights event, which has starting flights on June 28, 29 and 30, allows unlimited reentries, guaranteeing $888,888 for the victor. The most-anticipated event of the entire poker calendar, the WSOP Main Event World Championship, will kick off with the first of three flights on July 3. That one will once again come with a $10,000 price tag, no reentry and two-hour blind levels. Players next year will be starting with even more chips though, with a starting stack of 60,000 – up from 50,000 in 2018. May 30 Big 50 No-Limit Hold’em 1a $500 50,000 50 minutes 1/flight $5M; $1M for 1st 11 a.m.
May 31 Big 50 No-Limit Hold’em 1b $500 50,000 50 minutes 1/flight $5M; $1M for 1st 11 a.m.
June 1 Big 50 No-Limit Hold’em 1c $500 50,000 50 minutes 1/flight $5M; $1M for 1st 10 a.m.
June 2 Big 50 No-Limit Hold’em 1d $500 50,000 50 minutes 1/flight $5M; $1M for 1st 10 a.m.
June 7 Millionaire Maker No-Limit Hold’em 1a $1,500 25,000 60 minutes 1/flight $1M for 1st 10 a.m.
June 8 Millionaire Maker No-Limit Hold’em 1b $1,500 25,000 60 minutes 1/flight $1M for 1st 10 a.m.
June 13 Seniors No-Limit Hold’em (50+) $1,000 20,000 60 minutes 1 10 a.m.
June 14 Double Stack No-Limit Hold’em 1a $1,000 40,000 60 minutes 1/flight 10 a.m.
June 15 Double Stack No-Limit Hold’em 1b $1,000 40,000 60 minutes 1/flight 10 a.m.
June 21 Monster Stack No-Limit Hold’em 1a $1,500 50,000 60 minutes None 10 a.m.
June 22 Monster Stack No-Limit Hold’em 1b $1,500 50,000 60 minutes None 10 a.m.
June 28 Crazy Eight’s No-Limit Hold’em 1a $888 40,000 30 min Day 1; 60 min Day 2 Unlimited $888,888 for 1st 10 a.m.; 5 p.m.
June 29 Crazy Eight’s No-Limit Hold’em 1b $888 40,000 30 min Day 1; 60 min Day 2 Unlimited $888,888 for 1st 10 a.m.
June 30 Crazy Eight’s No-Limit Hold’em 1c $888 40,000 30 min Day 1; 60 min Day 2 Unlimited $888,888 for 1st 10 a.m.
July 3 Main Event World Championship 1a $10,000 60,000 120 minutes None 12 p.m.
July 4 Main Event World Championship 1b $10,000 60,000 120 minutes None 12 p.m.
July 5 Main Event World Championship 1c $10,000 60,000 120 minutes None 12 p.m. The World Series of Poker is an ever-evolving entity, and 2019 will be no different. We asked Seth Palansky, vice president of corporate communications, about the changes that players can expect for next year’s edition. "We hear the cries for more value and we are hard at work to deliver that more effectively this year." Poker players are not shy about providing feedback about changes they’d like to see, so we asked Palansky what player feedback has been taken into account for the 2019 schedule. “If there is one main one, it is value. We hear the cries for more value and we are hard at work to deliver that more effectively this year. After a successful 2018 WSOP that saw a record 123,865 entries and the biggest ever prize pool total of $266,889,193, what are the expectations for 2019? Apart from the many exciting bracelet events going on daily in the Rio Convention Center, players can also count on the usual array of Rio Deepstacks tournaments starting at a $70 buy-in, a variety of single table satellites, and live cash games from low- to high-stakes running 24 hours a day throughout the series. Players in New Jersey and Nevada can play real-money games on WSOP.com and participate in countless satellites into WSOP events, including the $10,000 Main Event. As long as you are within the borders of either of those states, you are also eligible to play in the WSOP online bracelet events that will surely appear on that complete 2019 WSOP schedule. Rooms at Caesars Las Vegas properties are now available for booking with rates starting at $33 for Caesars Rewards members. Online pre-registration for individual WSOP events will open in March or April, once the schedule has been locked in. So start marking the calendar and perusing flights to Sin City. The above dates, times and events are still subject to change, but you can expect the full schedule of events in the first quarter of 2019. The Muck: Should There Have Been a Day Off in 2018 WSOP Main Event?